This peak is #1 on the Height List for New Hampshire . 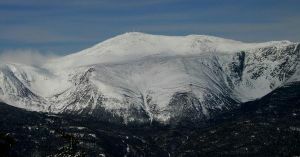 This peak is #1 in Prominence List for New Hampshire .Mount Washington has numerous trails that criss-cross the massif and go to the summit. There is also a paved road up the back, and a cog railway. Despite the paved roads, it offers many technical routes. It is also not to be under estimated since it has a reputation for bad weather. In April 1934, a wind speed of 371 km/h was recorded before the wind measuring instrument was destroyed. This is the highest wind speed ever recorded on Earth's surface. It also has a cog railway built in 1869 which goes to the summit. For safety to prevent runaways, the locomotives push rather than pull the coach. Their boilers built on an angle such that they are level on the steepest part of the climb. The "cog" in each steam engine "climbs" a steel ladder which goes up the center of the track. The track is just a single track, and so there are several sidings where upbound trains meet the return trains in order to pass.